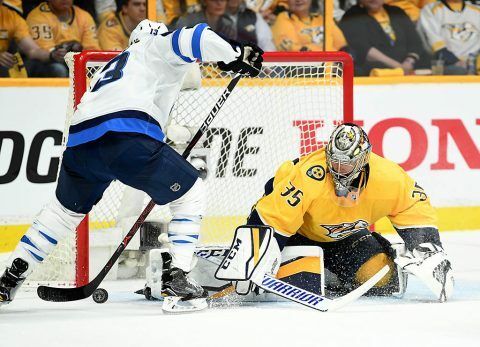 Nashville, TN – The Nashville Predators never seemed to get on track against the Winnipeg Jets Friday night at Bridgestone Arena as the Jets take game one of their second round series against the Predators, 4-1. 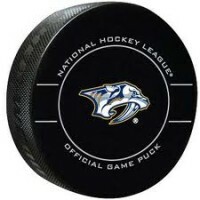 The series that the “experts” say could determine who represents the Western Conference in the Stanley Cup finals has Nashville down by a game. Brandon Tanev put Winnipeg on the scoreboard at 14:51 of the first period with a wrist shot past Pekka Rinne for the early 1-0 lead. Then Paul Stastny extended the Jets lead with his wrist shot at 9:01 of the first period for the 2-0 lead. Not much changed in the second period as Mark Scheifele banked in a goal at 17:51 for the 3-0 lead and Winnipeg took control of this game. Nashville outshot the Jets by a wide margin but could not find the back of the net, until Kevin Fiala scored at 1:23 of the third period. The Predators started the third period with Juuse Saros in net after Pekka Rinne was pulled at the end of the second intermission. Rinne left the game with 13 saves on the night. Jets goalie Connor Hellebuyck stopped 47 shots for Winnipeg and is the reason the Jets won the game. Game two of the series is Sunday at Bridgestone Arena. Puck drops at 6:00pm.